Esters can be reduced to aldehydes with diisobutylaluminum hydride (DIBAL) a bulky source of hydride ion. Although the aldehyde is intermediate in the reduction of esters with lithium aluminum hydride (LAH), it cannot be isolated. Aldehydes are more reactive than esters. If the desired product is an aldehyde, a milder reducing agent is needed which can stop the reduction at the aldehyde oxidation stage. For this purpose, bis(2-methylpropyl)aluminum hydride or diisobutylaluminum hydride abbreviated DiBAL or DiBAl-H can be used as a reducing agent. The reaction is performed in hexane at low temperature (-78°C) to prevent further reduction of the aldehyde. Because at the higher temperature DiBAl can reduce aldehydes and ketones to alcohols. In the first step of the mechanism, a lone pair of the carbonyl oxygen attacks the empty p-orbital of aluminum in DiBAl (this molecule acts as an electrophile), forming the bond between them. The hydride ion which is bonded to aluminum attacks the carbonyl carbon, resulting in the formation of a neutral hemiacetal intermediate. 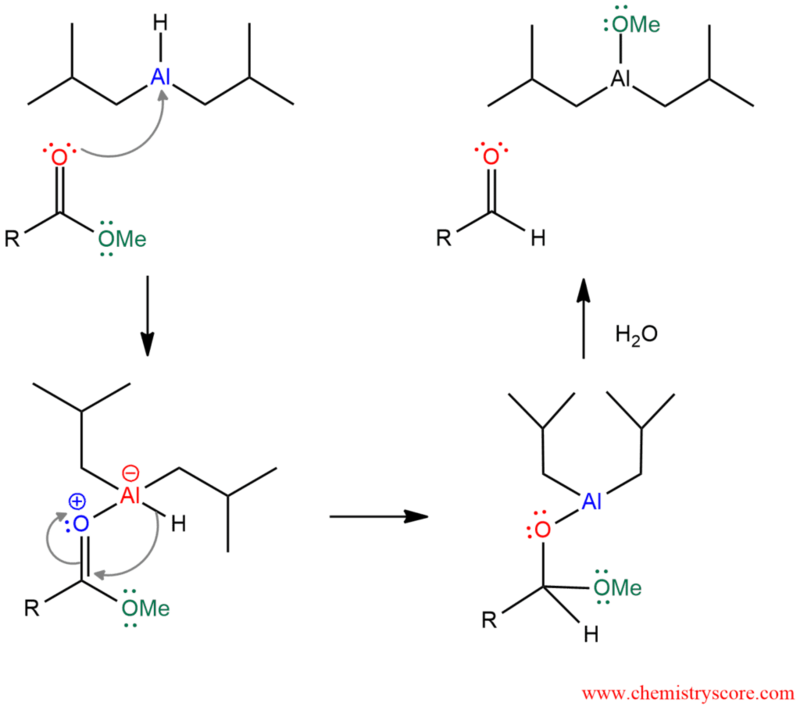 The last step is not fully clarified and there are several versions how water promoted the formation of aldehydes.